... Dark Beat Factory is a show represented by El Grego ans Deejay Moldavius. In each show will be placed a awesome guest . The sound is going to resound dark and techno. We are not men of music. But we respect the power of music, for that is what transformed us. The music of the Techno Code. Others had heard them, contemplated them, and so on. But we understood them, and they changed us. For what was we before we heard those music? Nothing." Amazone records is a French label of electronic music since 2005, thanks to its several collaborations, the label is always inspired and enriched by various European and world musical currents. Perc (Uk), Tom Hades (Be),Submerge (Usa), David Carretta (Fr), Electric Rescue (Fr), Citizen Kain (fr),Tom Dazing (Be),Rickzor (Sp) , R-Play (fr), Harvey mc Kay (Sc), Marco Asoleda (Fr),D'Jamency(fr) Axel Karakasis (Gr), Stanny Franssen (Be),John Lagora (De), Audio Injection (Usa),René Walther (rD), Mark Morris (Ita), Logotech (Ita), Masuki (D),Avex Axiom (Usa), Jon Virtue(scotland),Drumcomplex (De),Frank Sonic (De), Greg Delon (fr), Redhead (Be), Sound Bros (Ita),Steve D aka Tevatron (fr),Tom Parris (UK);Leghau (Fr), Divai (Fr), Mickael Davis aka Dolby D (Fr), Millimetric (Fr),Lady K & Luca Daddy (spa),dj Mary (Cr) Jan Liefhebber (Nl), Anton X(Fr), Morgan Tomas (Fr), Plankton (Fr), London Fm (Ita)Pedro Bucarelli(Fr),James Kameran (sp),Peja (Ita), Trebor (Fr), Roman Kramer(Fr), Flex (Fr)etc..
Coming from the 90’s rave scene, D’jamency is the founder of the orbital Space association and the co-founder of Amazone rec. He is a reserved individual who learnt his trade by keeping in close contact with and a watchful eye on some of best electronic artists since 1994. Originally from Lyon, this Dj-Producer is now one of France’s electronic music scene’s new rising stars. over the last twelve years or so, he has relentlessly made his presence felt at events, clubs and festivals in both France and abroad (notably Switzerland, Germany, Spain, Belgium, Asia...). Increasingly sought after and respected, D’jamency is regularly found side by side with internationally renowned Djs and live acts (Richie Hawtin, Carl Cox, Marco Bailey, Umek, Monika Kruse, Dave Clarke, Agoria, Oliver Huntemann, Joris Voorn, Miss Kittin, Anthony Rother, Scan’X, Vitalic, The Hacker, Oxia... ). His style varies - according to his audience - from house-tekhouse or electrotek to tribal through to kicking techno, as well as minimal or groovy sounds, creating an irresistible hypnotic atmosphere on the dancefloor. His on-deck performances (special dj-set with 3 or 4 decks and Traktor Scratch Pro & X1 Kontrol) have left their mark on dancefloors across Europe thanks to his irrefutable mixing prowess and flawless technic. His accumulated experience over the years, and his on- the-ball, evolutionary musical selection, has allowed him to effortlessly seduce his public. Artist to the core, he is equally devoted to electronic music production for numerous labels and audio-visual companies (audio design, film, short film and advert scores / soundtracks) since 2001. 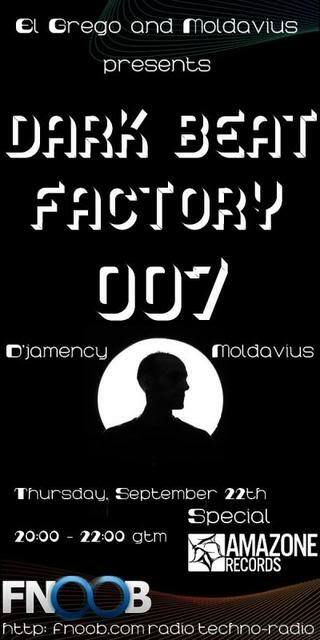 For multiple releases, D’jamency has collaborated with famous Dj and producers such as Audio Injection, Axel Karakasis, Tom Hades, Dj Mary, Jan Liefhebber, Nimbuz, Stanny Franssen, Superstrobe, Killian, Electric Rescue, Citizen Kain, Greg Delon, Dolby D, Atochi, Leghau, Lowkey & Kardinal, Daegon, Cortechs, Viktor Leske, Damolh33, John Lagora, Commuter, Ivan Deyanov, Alfonso Forte, Oliver X, Marco Asoleda, Atix... & many more ! This artistic adventure continues because D’jamency offers and proposes to its audience a constant renewal.